A superb colorist, artist Morgan Weistling brings this scene to life with spectacular lighting, creating a sense of wonder and engaging the viewer’s imagination and emotion. Like a skilled movie director, he manipulates the focus of interest with suggestions and impressions of forms that are barely realized and allow the viewer’s imagination to fill in the details. "The Fishing Hole" is a unique, personal homage to brotherly love and childhood magic. 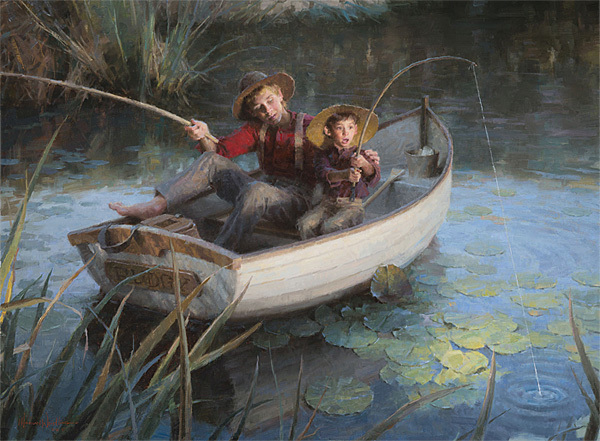 “I was originally going to title this painting Brothers,” explains artist Morgan Weistling. “It is as much about the joy of fishing as it is about the bonding experience that fishing allows. I painted it in memory of my older brother, Steve. I have fond memories of him teaching me all of the things he knew about fishing and camping. I painted the older brother with his hand on the younger boy’s shoulder representing that protection that I always felt when I was with Steve. It was pretty handy having a brother that was 6' 4".